Sicilian pizza is also known as sfincione or focaccia with toppings. This form of pizza was popular on the western part of the island of Sicily dating back to the 1860s. Pizza was a popular dish in western Sicily by the mid-19th century. The version with tomatoes was not available prior to the 17th century. It eventually reached America in a slightly altered form, with a thicker crust and a rectangular shape. 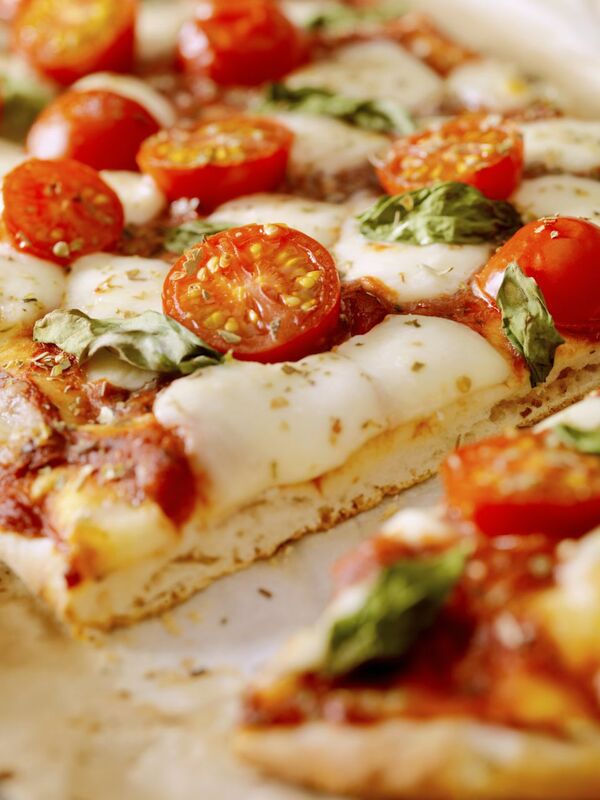 If you like thick, spongy square pizza loaded with sauce and cheese, then this Sicilian pizza recipe will not disappoint. While it's not the authentic version from Sicily, which usually does not include cheese and does include anchovies, it's a recipe for the classic square pizza that Americans have come to love. We like this pizza with our classic New York-style pizza sauce, but any cooked tomato sauce works great. In a medium bowl, stir together the water and yeast. Let rest until the yeast bubbles, about 5 minutes. In a large mixing bowl, mix 3 cups of flour and salt. Add yeast mixture and 1 tablespoon oil and stir together to form a sticky dough. Knead dough, adding remaining flour a little at a time until dough becomes a smooth, elastic ball, about 6-9 minutes. Alternatively, use an electric mixer with the paddle attachment to first combine ingredients and then switch to the dough hook. Add flour a little at a time until dough comes away from the sides of the bowl, about 3-5 minutes. Coat a medium bowl with 1 teaspoon of oil. Turn dough into the bowl and cover with plastic wrap. Let rise until it doubles in size, about 30 minutes. Rub remaining oil all over a 13" x 18" rimmed baking sheet until it is thoroughly coated. Turn dough onto baking sheet and stretch it with your fingers a little toward edges of the baking sheet. Don't overstretch it and be careful not to tear--don't worry about it reaching all the way to the edge yet. Cover ​the baking sheet with plastic wrap and let sit until dough expands to nearly reach the edges, about 2 hours. Preheat oven to 500 F, or as high as your oven will go. Uncover baking sheet and with oiled hands; gently stretch dough to the edges and corners of the baking sheet. Top the dough with sauce (make sure to leave about an inch of bare dough around the edges for the crust), cheese, and fresh basil leaves. Bake until the cheese and crust begin to brown, about 20 minutes. Let cool for 5 minutes before slicing into square pieces. Doughy, Cheesy Neapolitan Pizza—It's Certified!